Last weekend I performed for Charlie’s 9th birthday party on Mercer Island (Seattle). Charlie and his parents had decorated the house to make it look like a castle and different parts of Hogwarts. 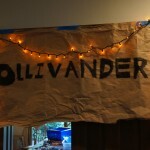 When guests arrived they visited “Ollivander’s Wand Shop” to receive a magic wand. 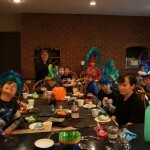 For more information about my magic shows for kid’s birthday parties throughout western Washington, visit www.mymagicparty.com, send e-mail to jeff@mymagicparty.com, or call me direct at (360) 412-5064. 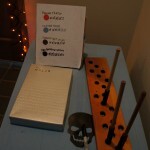 This entry was posted in Uncategorized and tagged birthday party, birthday party magician, Harry Potter, Harry Potter magic show, magician, Mercer Island, Seattle, seattle magician. Bookmark the permalink. 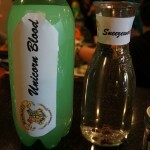 Are you free this Saturday (3/16/13) for a Harry Potter 8th birthday part in Lake Stevens? If so, how much would that cost?